This ticket grants you admission to the event, a 2oz sample of specialty mac and cheese at each location, $4 featured drink specials, and tons of fun! $1 per ticket will be donated to charity. Each attendee also gets a $5 off coupon to each location to be used at a future date. This ticket include everything with General Admission tickets PLUS an official Manayunk Mac and Cheese Crawl custom t-shirt and your first drink free! 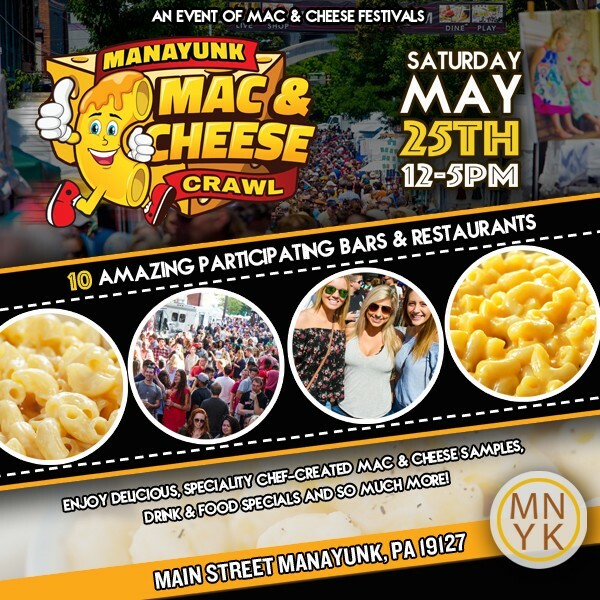 Join Us for Manayunk Mac and Cheese Crawl with 10 amazing particpating bars & restaurants on Saturday May 25th from 12-5pm! Enjoy delicious, speciality chef-created mac & cheese samples, drink & food specials (craft beer, mixed drinks, and wine), and so much more. An absolutely incredible value and one heck of a fun afternoon with friends! Join Us! Can't make it at noon? No problem - start any time! Tickets are very affordable - early bird discount is for those that buy well in advance. Ticket prices WILL INCREASE as we get close to the event or selling out. Ticket sales are limited to ensure an amazingly fun experience for all. Additional discounts available for groups of 15 or more people - email us for more info.